Starting Indoors: Start indoors 6-8 weeks before planting out. Keep at 55-65°F. Starting Outdoors: Direct sow in early spring into cool soil. One of the best flowering groundcovers, with large tresses of impeccable pea-shaped flowers blooming over a long time in summer. Provide a structure for it to scramble up, such as a trellis, fence, wall or stump, or feature in cottage or wall gardens. Non-invasive. Fertilizer: Mix in a few inches of compost prior to planting and topdress with an additional 2" or so every spring thereafter. If soil is not rich, apply a granular or liquid feed fertilizer every month throughout the growing season. Diseases & Pests: If slugs are troublesome, sprinkle some diatomaceous earth, crushed eggshells, or iron phosphate pellets on the ground around the base of the plant. Aphids can be a nuisance; hose plants down daily until the pests are gone, or apply an insecticidal soap. Avoid powdery mildew and leaf spot with proper spacing in a location that has good air circulation. A preventive organic fungicide can also be applied. 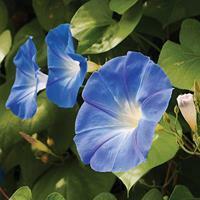 Plant: A rhizomatous trailing/climbing green vine with winged stems, clad with oval-shaped paired leaflets and tendrils. Flowering: Showy 1" wide white pea-like flowers. Seeds: Flowers produce pods containing the seeds. Both pods and seeds are toxic if consumed. 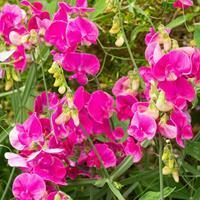 This plant is also referred to as wild sweet pea and perennial pea, and is native to southern Europe and northern Africa. It has naturalized throughout much of North America.